It’s hard to believe but the holidays are right around the corner. Are you ready? Of course not. There is so much to do. Take a moment to relax and reflect. Enjoy the holidays with delicious Laphroaig Single Malt Scotch Whisky. Parties are being planned and Christmas gifts are being bought all around the world. Laphroaig Single Malt Scotch Whisky makes the ideal holiday gift for that Single Malt Scotch Whisky connoisseur in your life. Drink the best form the #1 Islay Single Malt whisky in the world. Laphroaig is offering your choice of premium, holiday gift options. The top scotch whisky brand released two brand new, limited edition expressions. They are perfect for the holidays. Laphroaig 25 Year Old is a unique expression with creamy, sherried flavor that is perfect for scotch lovers in your life. 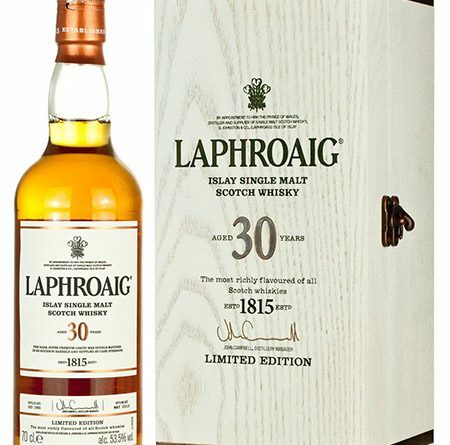 In addition, the limited edition Laphroaig 30 Year Old brings to mind the seasonal flavors of almond and sage and is perfect for holiday dinners on a cold winter evening. It’s important to remember the important things in life. The holiday season is a time to spend with the ones closest to us. Asa result, be sure to include Laphroaig’s subtly sweet Cairdeas Madeira in your holiday gathering. It’s barrel aged in ex-Madeira casks for the perfect, smooth taste. It is also the annual release of Laphroaig’s Cairdeas, which translates to “friendship” in Gaelic. So be merry, drink and have a wnderful Christmas holiday season. We hope you get the chance to buy or try one of these awesome Laphroaig Single Malt Scotch Whisky choices. This is 2016’s iteration of Laphroaig’s annual “Cairdeas” release, expertly crafted by distillery manager John Campbell to celebrate friendship (“Cairdeas” means friendship in Gaelic). It features fully matured Laphroaig aged in ex-bourbon barrels before being artfully married together for a second maturation in Madeira seasoned traditional casks. The result is a unique expression to be savored among good friends. It is a rare and unique expression, and the newest addition to the Laphroaig portfolio of Single Malt Scotch Whiskies. This uncommonly exquisite liquid is a non-drill filtered marriage of Laphroaig’s signature Islay peat, with sherried, oaky flavors from second-fill European Oak Oloroso sherry casks and creamy, sweet flavors from American White Oak bourbon barrels, bottled at cask strength. The result is a whisky with exceptional character and depth. It’s a rare limited-release from Laphroaig Single Malt Scotch Whisky, and features notes of toasted almond, save and a subtle touch of the peat smoke that is Laphroaig’s trademark. Like the wave-washed granite walls at the Laphroaig distillery, Laphroaig 30 Year Old has acquired rounded character and exceptional smoothness through a double maturation in the first and second-fill ex-Bourbon barrels. Be sure to treasure the Christmas holidays with Laphroaig Single Malt Scotch Whisky. Perfect for any social occasion. Stop by again and read more spirit and fine liqueur articles in our luxury blog.